This Test is based on Previous CIL MT Exam Paper. Helpful for upcoming exams. See First Part of CIL MT Paper. 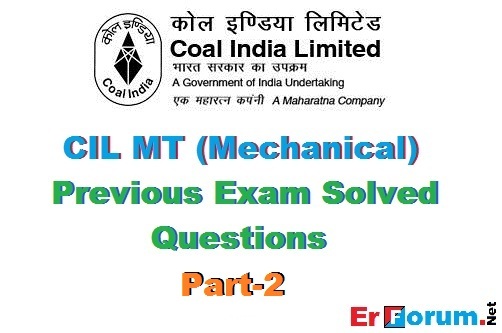 Useful for CIL MT (Mechanical) and other PSUs Exams. (b) The former tend to form densely packed, highly coordinated structures and the latter is less densely packed. (d) The former are the only structures that are not artificially manufactured. 2. Which of the following statement regarding PERT is incorrect? c. It points out slippages before the fact happens and its impact on others. d. It helps to formulate new schedules when the existing schedule cannot be met. 8. Which glass is resistant to heat and chemicals? *Note: If any confusion in any concepts of these questions, Please ask through comment we will reply you.